Did you hear there was a murder on Broadway? Okay, it wasn’t actually ON Broadway per se, but at the Fullerton Maverick Theatre in a show called Murder on Broadway, by Movable Mysteries. The Maverick Theatre, a quaint, cozy place, is just perfect for a murder mystery show. 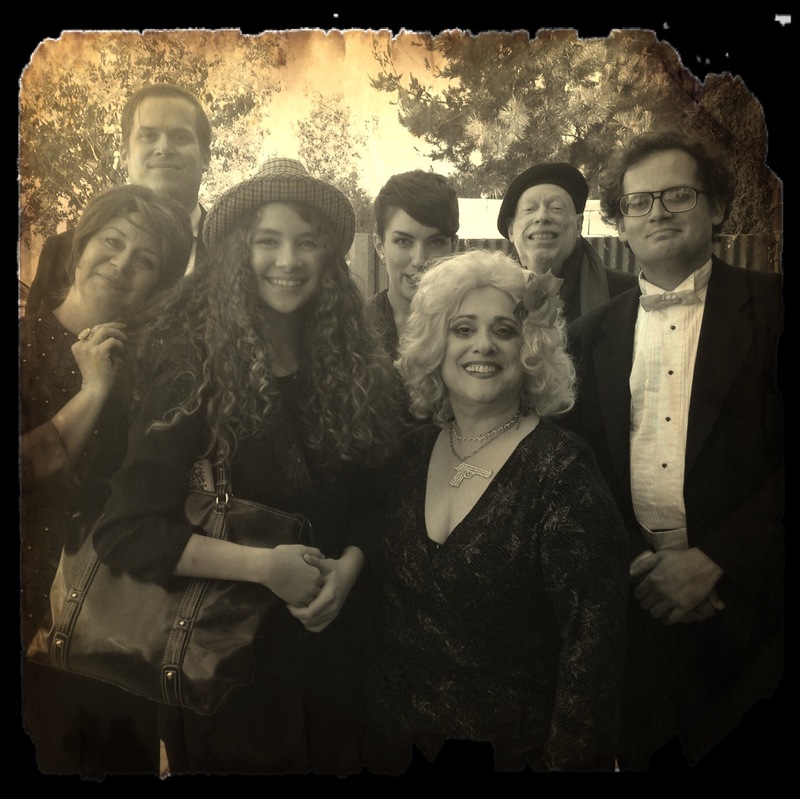 While the audience sat waiting for the performance to begin, a quiet little door opened to reveal a gregarious, over-the-top character who introduced herself to each member of the audience personally as Toffee Alto, the Mafia Queen. She was full of kooky humor, enthusiasm, and charm. I even ended up performing an impromptu can-can dance with her before the show! Other characters soon followed her out the door to work the audience. It was a great way for everyone to connect with the cast of characters even before the show began. The small cast included Maureen Lawrence as Toffee Alto the Mafia Queen, Bob May as Tony Alto the Mafia King & Bernie the Actor, Tree Henson as Mimi the Reviewer, Topher Mauerhan as Baxter the Producer, Travis Rhett Wilson as Eli the Playwright & the Thug, and Natalie Beisner as Abigail the FBI Agent. There were two standout performances. Lawrence was loads of fun. She was very comfortable interacting with the audience and made us all feel a part of the show itself. My favorite moment of the show was the parody she performed of “Broadway Baby” called “Mafia Queen.” It was as bad as it was supposed to be and every bit as hilarious. Henson’s portrayal of a martini obsessed Mimi was comical and engaging. I could not stop laughing at her fixation on the martini glass. At one part of the performance, she even spat an olive from her drink into an audience member’s lap! Although I enjoyed the show quite a lot, it did suffer some snags. A few times there were monologues that seemed to drone on and they could have easily been shortened. Beisner underwent difficulty delivering her lines due to laryngitis and lost the audience at a few key moments. The other cast members worked quickly to pull together as a team and help her along though. There were also a few moments of tawdry humor in the play, which those of you who know me, know I can always do without. Once the murder took place, it’s was then the audience’s turn to play detective. Each member of the audience used a slip of paper to make their accusation as the cast worked to persuade decisions. Surprisingly, there were very few who solved the mystery correctly, but this Murder She Wrote, Agatha Christie Mysteries, and Sherlock Holmes loving kid carefully followed the clues and solved the case! All in all, it was a sleuthing good time. I look forward to cracking the next mystery in Tea Time for Murder, the Agatha Christie compilation showing July of this year! Thank you, Jes, for that great review! And believe it or not, we, the actors, have just as much with the audience as they have with us! Can’t wait to see you at “Teatime for Murder” next month! Tickets Now On Sale at http://www.MaverickTheater.com. The Maverick Theater and MovEable Mystery Dinners present Sunday afternoon interactive comedy musical audience-participation whodunits! All Shows Sundays at 3PM. Starring Tree Henson as “Miss Marble”, Wendy Gallo, Maureen Lawrence, Bob May, Alexis Ritchey, Beth Titus and Christopher Yu. In this interactive, comic whodunit tribute to Agatha Christie, the peaceful village of St. Margaret Mead is rocked to the core by a shocking teatime murder at Lady Esterbrook’s palatial country estate. Luckily, nosy old Miss Marble is in the neighborhood and on the case, sorting through the suspects, turning up the clues and sleuthing rings around the local flatfooted constabulary. Help her solve the case, and you may win the big prize! Tickets – $20 Show Only (3PM), $45 Pre-Show Dinner and Show (1:30PM at The Matador Restaurant, Fullerton). Order tickets on-line at http://www.MaverickTheater.com. (714) 788-1745. Thank you for letting us know! We’d love it if your cast members want to come down to The Chance Theater to sing a song in our Broadway Themed Open Mic Night – The Ghost Light Vocal Jam on July 21st. Sign up starts at 7pm… get there early to ensure you get on the singers list. Tickets are $10 in advance and $!5 at the door. Come promote your show!